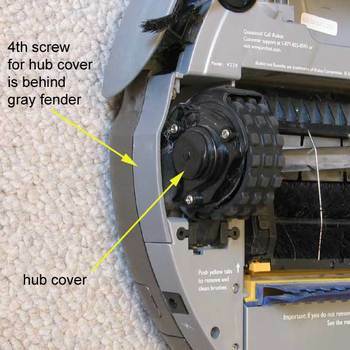 To reach the optical encoders, you must remove the hub cover by removing the 4 screws that attach it. 3 of the 4 screws are easy to reach, the 4th screw is concealed behind the fender. Therefore your mission is to gain access to the concealed 4th screw. Don't remove the 3 easy to reach screws just yet, wait until later. For now, make your work area organized and well lit and find a screwdriver that fits the screw heads properly.